Words are necessary for us to communicate with each other. We take words and combine them into sentences to communicate our wants, needs, thoughts, feelings, and interests. We also use words to ask questions to obtain desired information. Using words to communicate comes naturally and without effort for most people, but what happens when it does not, especially for your young child? First, don’t allow your concern to result into frustration and panic. Rather take note of your specific concerns regarding your child’s communication skills and how they are adversely impacting their ability to communicate with you regularly at home. Establish your child’s communication needs based on what is best for them and not what your expectations are for them based on your communication skills (which are typical, not delayed). This will allow you to lower your expectations and communicate with your child on their level (this makes communicating easier for them because there is less pressure). Consider what ways or situations that are pertinent to your family or child’s routine in which you want communication to occur the most (meal time, family-play time, grooming). Intentionally decide the vocabulary words that need to be taught to encourage the use of words and sentences within those settings. (Ex. mealtime- apple, cup, spoon, plate., Ex. grooming-toothbrush, water, sink, towel). Teach the vocabulary receptively first. o Present objects or picture representations of the vocabulary you choose. o Label these objects repeatedly but not with an immediate expectation for the child to imitate or use. o Add descriptions or functions of each object to stimulate their language and increase their understanding of why knowing and naming these objects within the setting presented is important. Encourage verbal use of these words over time. o Shape vocalizations and word approximations into real words/phrases. Note that imitation is a sign that spontaneous speech is possible and may occur soon. o Shape imitations into three to four-word sentences. Expand spontaneous word use of two to three words into complete sentences using description words and prepositions. 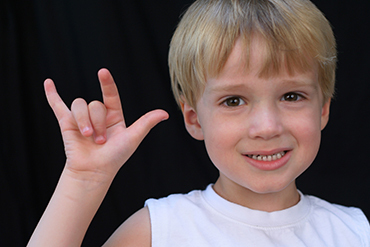 How Do You Know When Your Child is Ready for Speech Therapy Services? This question is not referring to eligibility for speech therapy services based on your child being tested or meeting specific qualification standards for services. Specifically, this question pertains to considering if your family’s daily routine/schedule, financial responsibilities, and expectations regarding your child’s speech and language development allow for the possibility of your child receiving services consistently over a significant amount of time. As an active speech language pathologist with a moderate size caseload, I don’t feel that this question is presented to parents enough. Scheduling your child to have speech therapy services is not like scheduling a doctor’s visit. Doctor visits are normally scheduled once or twice a year and allow for parents to schedule ahead to take time off work and to take the children out of school, if necessary. However, speech therapy, is a committed service that requires regular weekly or monthly visits over a course of 3-6 months. This can prove to be very challenging and overwhelming at times for parents, especially if they have not fully considered how to fit speech therapy into their family’s daily routine/schedule. Furthermore, speech therapy is a committed service that can have a significant impact on one’s finances. It is important to consider if your insurance plan will cover speech therapy services, if a co-payment will be due at the time of service, and if your insurance has a deductible that requires you to cover costs out of pocket that the insurance plan won’t cover. Also, what if you don’t have insurance or your insurance plan won’t cover speech therapy services? You must consider if you can afford the private pay prices offered by the speech language pathologist you use and if you can’t afford their prices, what other options are available to meet your budget. Lastly, speech therapy is a process. Often, the word “therapy” in speech therapy is overlooked. Therapy requires taking an old behavior and modifying it or acquiring a new one over time. For everyone involved (speech therapist, parents, patient), speech therapy requires patience and dedication to see progress happen steadily over a significant amount of time. For this reason, parents need to know what their expectations are for their child’s speech and language skills at the start of speech therapy and discuss them regularly with their child’s speech therapist. It is also important for parents to decide how involved they want to be in their child’s speech therapy sessions. Will you sit on sessions to observe and assist, or will you sit outside sessions and ask question regarding the session after is it over? Discipline plays a big role in how effective speech therapy can be for your child. How much of your child’s behavior will you allow the speech therapist to control? What boundaries will you set with the speech therapist with redirecting your child or correcting inappropriate behaviors. The primary goal of speech therapy is for skills or strategies taught within the clinical setting to generalize to the child’s natural environment (home and school) so that he or she may effectively communicate throughout his/her daily routine with family members and peers. Therefore, I know many parents of children with speech delays or diagnosed communication disorders are often told to work on speech therapy treatment goals at home with their children. Often times, parents can find this request to be so overwhelming. They leave thinking how they can carve out more time in their already busy lives to work on speech therapy goals. Don’t worry, I have the solution for you! First and foremost, it is important that you are aware of your child’s speech therapy goals. Make sure that you have a current copy of your child’s speech therapy evaluation report or plan of care. You can request a copy from your child’s speech language pathologist. From there the rest is pretty simple. The goal is to provide your child with consistent language stimulation. You do this by providing your child with a running dialogue throughout their daily routine such as during meals, grooming, dressing, car riding, grocery shopping, working in the yard, or simply playing outside, of the objects they are manipulating, the actions they are performing, the people they are interacting with, places they are going, and what they will be doing when they get there. To make things more vivid, here is an example: During breakfast time, you name all the foods your child has on their plate. As they begin to eat, you point out to them, “You are eating your eggs. The eggs have cheese in them.” “Your orange juice is in your cup. It will taste sweet when your drink it.” This example is based on a child that may have goals that target naming objects and using action words in sentences. The important thing to note is that you are not requiring your child to repeat you or to answer questions correctly, if asked. You are only stimulating their language to provide a model of following a command appropriately or using words meaningfully in sentences to communicate appropriately. However, there are times when we schedule a specific activity to do with our child to spend time with them or to simply create happy childhood moments. These moments include but aren’t limited to activities such as baking cookies, putting together a train track, or an arts and crafts activity. These types of activities allow for more in-depth and specific ways to work on your child’s speech therapy goals while also doing something they enjoy. Please check out my video: Speech Therapy Techniques : Play-Doh and Speech Therapy, where you will find a vivid example of what this interaction looks like while my son and I make some play-doh. This video provides captions of the potential goals and skills that can be targeted in an activity like this. If you are interested in trying this at home with your child, please download the Play Doh-Speech Therapy Lesson Plan, which includes flash cards of the nouns, action words, colors, and descriptive words associated with the activity. It also includes command cards for completing the recipe and “wh” question cards with the suggested responses that can also be used during the activity. Remember, no matter what you decide to do, make it light and enjoyable for your child! Working as an SLP, I am often asked, especially by parents of newly referred patients, "What can I do at home to help my child?" This is my favorite question because it shows me that the parent is concerned and willing to help the child as necessary to learn skills taught in therapy. I also like this question because it indicates to me that the parent will help to generalize skills taught in therapy into the home or natural environment, which is the overall goal of speech therapy. Be consistent in introducing new skills and maintaining skills previously learned. Be consistent with when skills are presented and learned. Will you work on the skills every day, once a week, every two weeks, on weekends? Inform your child of when this learning will take place in order for them to be prepared and ready to receive the information you are presenting. Be consistent with how the skills are presented. With the tv on or off? In a quiet room with one-on-one help? As a part of their daily routine with everyday tasks like grooming, eating, or play time? Will they use the computer, cut paste activities, and/ or books? How often will you reinforce skills learned? How will you handle making corrections? Overall, the key to being consistent is realizing how important the development and maintenance of your child's speech and language skills are to you and their ability to effectively communicate and independently function in their natural environment. It is also realizing that as parents, guardians, and/or family members, you are the main facilitator for establishing adequate communication skills for your child. Lastly, it is important to understand that consistency means being patient, willingness to work with your child on their level, breaking hard things down into smaller pieces, and willingness to ask for the help of those around you to assist your child. Check out this Skills Checklist to give you a jumpstart on how to work with your child in a more consistent manner. What are your thoughts? Please feel free to comment or to contact me with any further questions or concerns.